We are so very excited about the arrival of our third baby! It is truly a blessing! Since we were overseas for both, Luciana and Oliver's birth and first years, we realized we do need some beginner baby things! We decided this time to be surprised about the baby's gender! We appreciate the thoughts and love from all of our family and friends for our growing family! 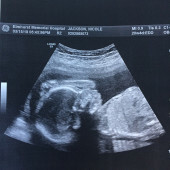 Baby Jackson #3 is already blessed and loved so much! Thank you in advance!